LingvoSoft Talking Text Translator English <-> Russian for Windows Mobile is part of LingvoSoft Suite - the complete language solution available only from LingvoSoft. The preferred tool of professional translators, this reliable utility translates virtually anything - from technical documents and e-mails to business and personal letters, and even entire books. LingvoSoft Talking Text Translator English <-> German for Windows Mobile is part of LingvoSoft Suite - the complete language solution available only from LingvoSoft. The preferred tool of professional translators, this reliable utility translates virtually anything - from technical documents and e-mails to business and personal letters, and even entire books. LingvoSoft Talking Text Translator English <-> Polish for Windows Mobile is part of LingvoSoft Suite - the complete language solution available only from LingvoSoft. The preferred tool of professional translators, this reliable utility translates virtually anything - from technical documents and e-mails to business and personal letters, and even entire books. LingvoSoft Talking Text Translator English <-> French for Windows Mobile is part of LingvoSoft Suite - the complete language solution available only from LingvoSoft. The preferred tool of professional translators, this reliable utility translates virtually anything - from technical documents and e-mails to business and personal letters, and even entire books. LingvoSoft Talking Text Translator English <-> Italian for Windows Mobile is part of LingvoSoft Suite - the complete language solution available only from LingvoSoft. The preferred tool of professional translators, this reliable utility translates virtually anything - from technical documents and e-mails to business and personal letters, and even entire books. LingvoSoft Talking Text Translator English <-> Portuguese for Windows Mobile is part of LingvoSoft Suite - the complete language solution available only from LingvoSoft. The preferred tool of professional translators, this reliable utility translates virtually anything - from technical documents and e-mails to business and personal letters, and even entire books. LingvoSoft Text Translator English <-> Spanish for Windows Mobile is part of LingvoSoft Suite - the complete language solution available only from LingvoSoft. The preferred tool of professional translators, this reliable utility translates virtually anything - from technical documents and e-mails to business and personal letters, and even entire books! 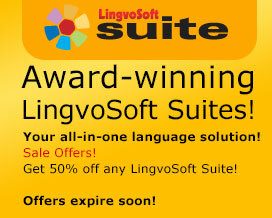 LingvoSoft Text Translator English <-> Russian for Windows Mobile is part of LingvoSoft Suite - the complete language solution available only from LingvoSoft. 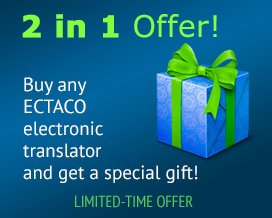 The preferred tool of professional translators, this reliable utility translates virtually anything - from technical documents and e-mails to business and personal letters, and even entire books!